Harmony, a simple word. Just whispering it in our own ears can make us feel so sunny and lighthearted. It has a special tone to it, and when it passes through our lips there is a contented buoyancy that comes with it. 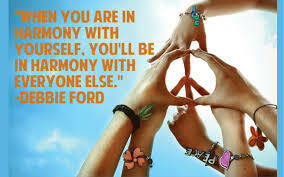 To have harmony in our life, is to recognize how fortunate we are. To realize harmony, is to confide that whatever the journey, there are riches and wealth that surround us. Our pot of gold may not be full of expensive coins, but the richness that allows us to connect to our Soul are abundant. Destiny has a way with itself. When our feet touch the ground each morning of a new dawn, we have a choice – to ourself speak of all good fortune, and remember harmony, or fill ourself with thoughts of the contrary. Peacefulness is found in those who have a fellowship with themselves. A deep profound connection to the person that resides within us, this is where harmony exists. To find this person, the one we urn to know, is the work of our Spirit. The emotional and intellectual energy, the natural embodiment of our authentic identity, this is the way of the Seeker. The work of our Soul is to find a consistent whole in which to live. In order to heal and repair what is incomplete and unhealthy, a commitment must be pledged. This promise of oath is an obligation to ourself, to remove the restraints that hold us back from emotional inspiration. Harmony – if you break it down, perhaps in simplicity, all it is saying is ‘trust’. Firmly believe in the certainty and assurance that if you make a responsibility to take charge and custody of ‘you’, all will be well. Harmony comes to those who vow to love their Soul. For it is those who love themselves with no judgment or conditions, that live a life harmoniously regardless of the journey.